​Today’s deals roundup includes a wide range of accessories such as keyboards, earphones, pen drives and more. This list we’ve created has plenty of products below 1k along with a cashback on Paytm Mall. This is the place where you’ll find all the best deals of the day on a variety of products. We’ve put together a bunch of gadgets in this list which includes smartphone accessories, power banks, earphones, speakers, computer accessories and more. The Dragon War ELE-G9 is a gaming mouse with seven control buttons which can be assigned for the specific actions as per the user choice. It has 512k in-store memory with macro-function that makes programming. The mouse comes with a gold plated USB connector to reduce corrosion. Purchase this device here. The Logitech K230 offers a wireless keyboard that is workable upto a distance of 10 meters. The company claims that it has a battery life of 2 years with no hassle of changing batteries. You can purchase this device here. The Logitech M235 wireless mouse receiver allows 6 devices to connect at once. According to the company, the battery will last 1 year without changing also, It has an on/off switch and sleep mode feature that helps in extending the battery life of the device. You can purchase this device here. The HP USB keyboard and mouse combo are available at a discounted price along with the cashback of Rs 275. The keyboard features adjustable legs that let you adjust the position as per your liking. The combo comes with a one-year manufacturer warranty. You can purchase this device here. The JBL Inspire 300 in-ear headphones feature twist-lock technology. As per the company, the earphones will not fall out of your ears even during the most intense physical workouts The JBL Inspire 300 is sweat-proof, water-resistant and can even endure rains. You can purchase this device here. The Zebronics Aura is an on-ear wireless headphone that comes with padded cups. The volume control buttons are placed on the ear cup. It also has a microphone that lets you take calls while the headphone is connected to your smartphone. As per the company, the headphone battery can last upto 5-6 hours with the charging time of 2 hours approx. you can purchase this device here. The boAt BassHeads 900 features swivel ear cups that gives flexibility to the headphones when it comes to carrying them around. It has a tangle-free cable with built-in mic and in-line remote to control volume and music track. You can purchase this device here. 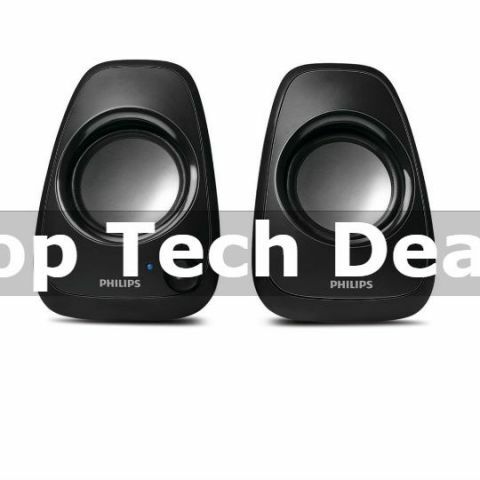 The Philips SPA65 is a wired speaker which can be connected to your laptop or notebook via USB. The speaker can be also connected to various other devices via AUX cable. It is a compact device with 2.0 channel stereo. You can purchase this device here. The Portronics Plugs Portable Speaker is a compact device and sleek in design. The device comes with a microSD card slot in which you can directly plug in your card and listen to music. It can also be connected to various other compatible devices via AUX and USB cable. The device also features FM that lets you listen to wide range of radio channels. Take a look at this device here. The F&D W4 Bluetooth speaker has multiple input sources such as TF card slot, micro USB, and AUX. As per the company, it can last upto 5 hours in one go. You can purchase this device here. The U-Globe UG-957 has dual-USB 2.1 port that can charge upto 2 devices. The device is equipped with a LED light that indicates the amount of charging left in the power bank. The company is providing 12 months of warranty to the users for any internal issue except the physical damage. You can purchase this device here. The Videocon 10000mAh power bank is equipped with 2 USB ports and one MicroUSB port for charging. The company is providing 6 months warranty on its 1000mAh power bank to its customers that does not cover physical damage. Purchase this device here. The SanDisk USB OTG pen-drive can be used for transferring files from your Android device to computer or vice versa. The company claims that it can transfer the files at the rate of 130MB/s. You can purchase this device here. The Intex IT-PB13K can charge multiple devices such as camera, smartphone, tablet and more. As per the company, the device features a Li-ion battery with more than 500 life-cycles. The device has 2 USB ports which are capable to charge upto 2 smartphones simultaneously. You can purchase this device here.